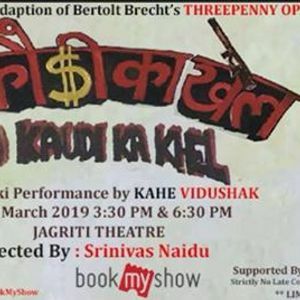 Do Kaudi ka Khel’ is a Hindustani adaptation of German playwright Bertolt Brecht’s popular play ‘The Threepenny Opera’ by Parimal Dutta. It bares the rise of the corrupt in different realms through unethical means. ‘The Threepenny Opera’ in turn was originally based on John Gay’s ‘Beggar’s Opera’. Dutta had made certain aberrations to structure the play in present day’s Indian milieu.